Bam Magar is an experienced and adventurous guide in Nepal Himalayas. He was born in Solukhumbu, which is known as the Everest region. He started his trekking career in 1992 as a porter and after his huge experience, he started to work as a guide. Then he was selected as a qualified trek leader at Exodus Travel (UK). He has also led numerous trekking trips also in India and Tibet. He has travelled himself to different countries of Europe and Asia, including United Kingdom. 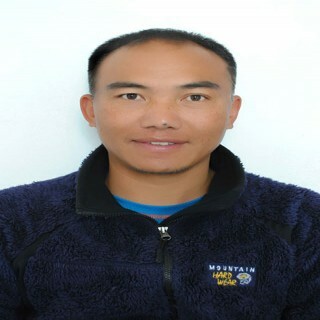 Bam Magar loves his work to lead the people in the adventurous trail and take them to the bosom of the high Himalayas. His excellency is built up due to his own birthplace, that is the region where the top of the world, Mt. Everest lies. He became familiar with the difficulties with the rugged trail and weather condition in high altitude. When he started to lead the treks, he loved his work and dedicate himself to making the trip fantastic. He is a friendly man who never gets irritated with his guests’ questions and enquiries. He is fluent in English and has taken different trainings as a guide, first aid course, eco leadership course, leader training, basic rock climbing training and others. He has registered a government authorized trekking company with the name of Explorer Adventure Company Pvt. Ltd. He wants to offer his professionalism to his clients and let them feel the difference in the trekking packages in Nepal. Get an opportunity to explore the Himalayan wonders and culture richness in Nepal with his responsible accompaniment.